Seven Selected in First Round - College Hockey, Inc.
Tkachuk, Hughes lead NCAA players and recruits at NHL Draft. Ottawa made Boston University’s Brady Tkachuk the first NCAA selection of the 2018 NHL Draft at No. 4. Seven NCAA players and recruits were selected in the first round of the 2018 NHL Draft Friday night at the American Airlines Center in Dallas. Boston University’s Brady Tkachuk and Michigan’s Quinn Hughes – the two youngest players in college hockey in 2017-18 – led the way, selected at No. 4 and 7 overall by Ottawa and Vancouver, respectively. Five incoming freshmen headed to five different schools were selected in picks 11 through 26. The seven NCAA selections in the first round surpassed last year’s total by one, the most since a record-setting 11 were taken in 2016. Tkachuk joined his father Keith as the first father/son combination from the NCAA ranks to both be selected in the first round. Keith, who also played at Boston University, was the 19th overall selection in 1990. Both Tkachuk and Hughes noted the benefits they received playing with and against older competition this year in the NCAA. 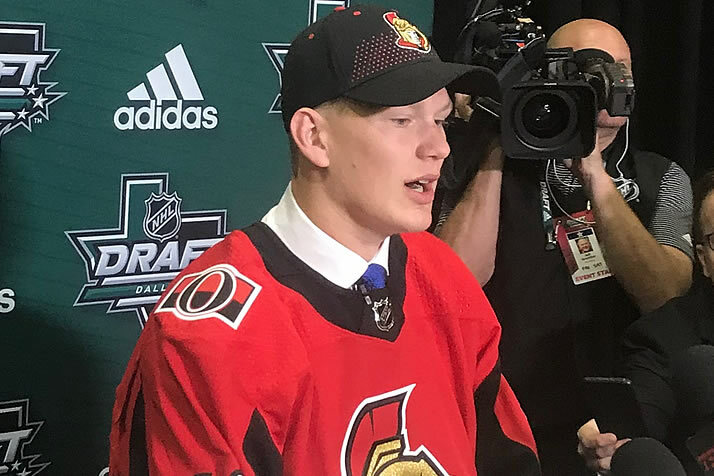 Tkachuk was the first of two Ottawa Senators picks from the NCAA ranks in the first round. North Dakota incoming freshman Jacob Bernard-Docker joined him at pick No. 26. The Philadelphia Flyers also took two players headed to the college ranks in the first round: Boston University’s Joel Farabee (No. 11) and Providence’s Jay O’Brien (No. 19). Boston University led all schools with two selections, giving the Terriers nine first-round picks in the last four years. Michigan and Boston College extended their streaks to 23 straight years of having at least one player selected in the NHL Draft. This marked the fourth straight year that multiple players who spent their draft year in college were selected in the first round. All-time first-round picks for schools who had players selected Friday: 22-Michigan (most of any school), 19-Boston University, 19-North Dakota, 18-Boston College, 13-Wisconsin, 4-Providence. Jacob Bernard-Docker, at No. 26, is the sixth Canadian player on the NCAA path to be selected in the first round of the last three NHL Drafts. The 2018 NHL Draft concludes Saturday with rounds two through seven, beginning at 11 a.m. ET. Television coverage will be provided by NHL Network in the U.S. and Sportsnet in Canada.